Photography means so much. I have a bad memory, so having photos around helps me remember great events in my life. There's also such a wonderful feeling seeing time pass between photos taken. I love holding up pictures of my daughter when she was a newborn, then at a year, and now at 2. Even in images taken a few months ago, I see things about my daughter I didn't even realize, since days seem to blend together. 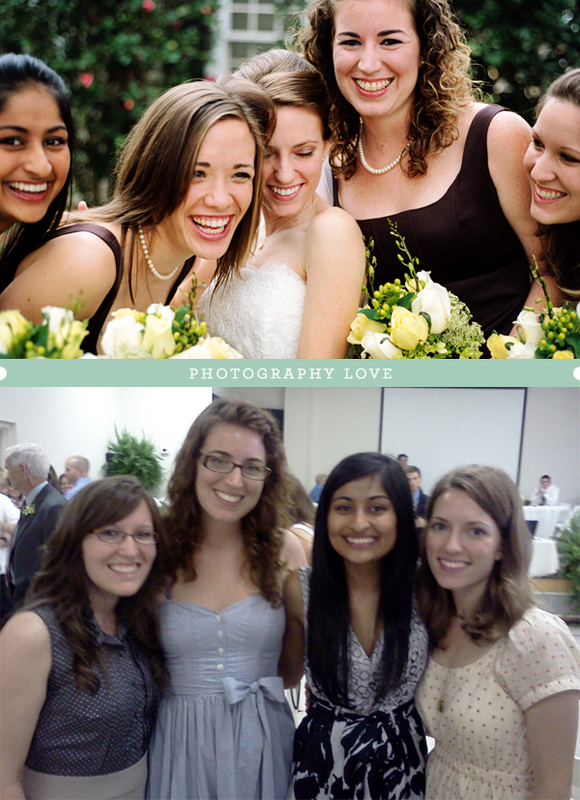 When seeing all but one of my bridesmaids at a wedding earlier this year, we had to take a photo of the group together, a little reunion. When my friend sent her phone shot to me, I immediately thought of this first image, taken on my wedding day. Then I recall tons of snapshots from college of us all together. This has nothing to do with film or image quality. It's about memories, nostalgia, and the way a photograph can make you feel. It's a wonderful thing. Note: Top image taken by Bryan Johnson. Second image taken on Brittany's phone. love it! Such a cute post... I never remember to comment since I usually read you blog in Google Reader. But, today I made an exception!! Miss you!